Philips launches its first Freeview HD recorder | What Hi-Fi? 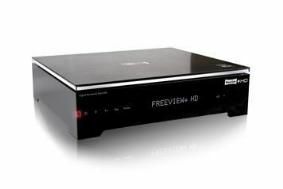 In the meantime, we're starting to see a few more Freeview HD set-top boxes trickle into the market, and Philips is one of the first to confirm an officially approved Freeview HD PVR (personal video recorder). The previously mentioned 3View HD PVR is still awaiting formal accreditation. The Philips HDT8520 is designed by Pace – which bought Philips's set-top box business two years ago – and has a 500GB hard drive. This will enable recording of up to 250 hours of standard-definition programmes, or 125 hours in high definition. It's due to go on sale in the UK from mid-May for £299, and will be available from Comet, Dixons, John Lewis, Richer Sounds and other retailers. Twin DVB-T2 tuners are built in, so you can watch one programme while recording another, and the on-screen graphics and menu system have been designed in conjunction with Philips to match those of current Philips TVs. "We've combined Pace technology with the prestige of the Philips brand," says Olivier le Balle, retail group account director of Pace. There's even an Ambilight-style light strip around the upper edge of the box to match Philips Ambilight TVs, although this can be switched off if you don't like it. Connectivity includes two USB sockets (one on the side), an ethernet port, optical and coaxial digital outputs for Dolby Digital 5.1, an HDMI socket and Scart connection. There's also an auto 'eco mode' which switches the box off after a pre-set number of hours if it hasn't been used. For those who don't want or need the HDT8520's recording ability, Philips has developed the £159 DTR5520 Freeview HD receiver, on sale from mid-April. Like its PVR brother, it has 1080p upscaling via HDMI, and the box will decide automatically which picture resolution to send to the screen. The DTR5520 has a separate power supply to keep the box itself as compact as possible, and does with single USB, ethernet, HDMI and Scart sockets. There's a coaxial digital output, but no optical one. Philips is proud of the DTR5520's low energy consumption of "less than 6W, or below 1W in standby". There's no BBC iPlayer compatibility at this stage on either model, although it's under consideration and may be added later.